There are a lot of on-camera lights available and they vary greatly in both price and performance. I wanted to take three of the on-camera lights I own to see how they stacked up against each other. The three lights are the Litepanels Luma, the Lumos Trip Pro and the Cineo Matchbox. 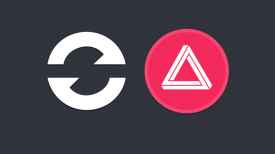 All three are priced around the same level so I thought it would be interesting to see which one comes out on top. Please bear in mind that this isn’t a truly scientific test, though I did my best to provide a consistent and controlled test environment. The Lumos Trip Pro is an on-camera LED light with a 100W tungsten equivalent output. It features variable colour temperature control from 3200K to 5600K and a dial for flicker-free dimming from 0% to 100% output. For wide coverage, the Trip Pro has a 85° beam spread, which can be narrowed to 55° using the included snap-on honeycomb grid filter. It is powered using optional Canon LP-E6 type batteries, or brick-style batteries using an included P-Tap power cable. 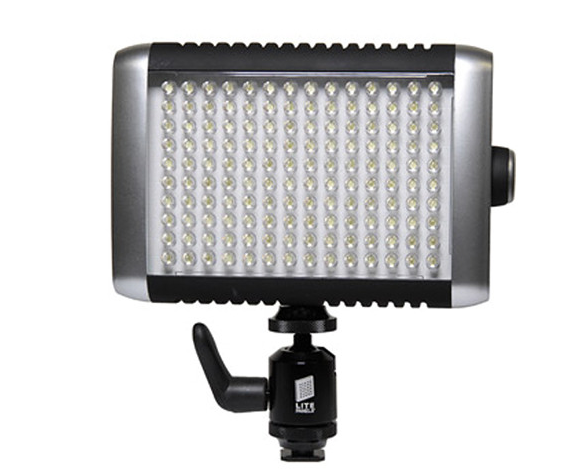 The light can be mounted to an articulating arm or monitor support via the 1/4″-20 threaded hole at the bottom, or directly to your camera’s hot-shoe using an included shoe mount adapter. It retails for $367.08 US. 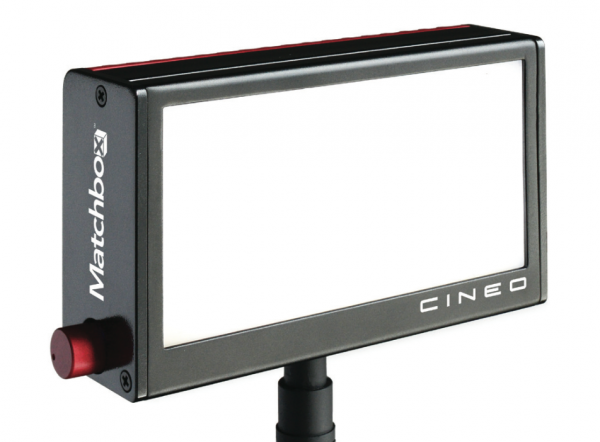 The Basic Matchbox kit from Cineo features remote phosphor technology for changing colour temperature by swapping out panels for higher output and greater colour accuracy. 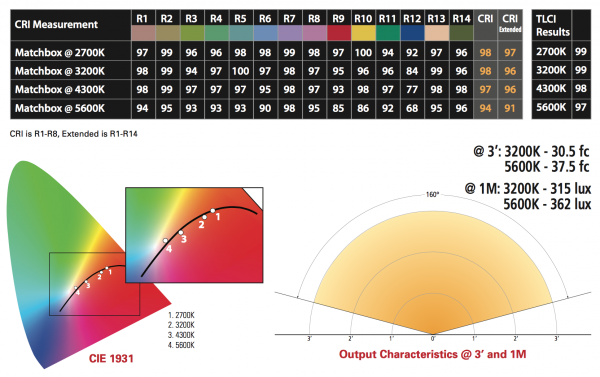 It has CRI ratings of 98 at 3200K and 94 at 5600K as well as TLCI ratings of 99 at 3200K and 97 at 5600K. Output at 3′ is rated at 315 lux / 30.5 fc at 3200K and 362 lux / 37.5 fc at 5600K. Additionally, it has a wide beam angle of 160° along with both local and DMX dimming options from 0-100%. The panel is durable with a weather-resistant construction and the units are made in the USA. The 3.25 x 5.25 x 1.5″ panel also emits zero UV light and has a 1/4″-20 thread on the base for mounting in a variety of situations. An AC adapter is included, along with a 6′ extension cable and both 3200K and 5600K phosphor panels. Optional battery kits can convert it for ultra-portable operation. The Cineo retails for $462.83 US. The Litepanels Luma On-Camera LED Light is a high illumination light that when equipped with an included half-white diffuser produces a soft daylight colour. It’s bright enough to effectively erase deep shadows outdoors as well being useful as a fill light indoors. Luma delivers in a 50° beam spread, flicker-free at any frame rate and at any shutter angle. A brightness dimmer is 100-0% adjustable and causes no colour shifts during dimming. The Luma can be powered by six AA batteries, AC power supply, or by DC power from a camera (via a D-tap cable). Included are a ball head for mounting, three CTO gels, and a custom carrying bag. The ball head features a cold shoe on one end and a 1/4″-20 screw on the other — the cold shoe for mounting to camcorders, DSLRs or stands, and the 1/4″-20 screw for attaching to the hole on the underside of the Luma. The three-piece gel set consists of a 1/4 CTO, a full CTO and a 1/2 white diffuser. It retails for $396 US. The results from each category are listed below. These findings are my personal assessment from using all three of the lights over a long period of time. I would never recommend anyone to base a buying decision on just one opinion and review. 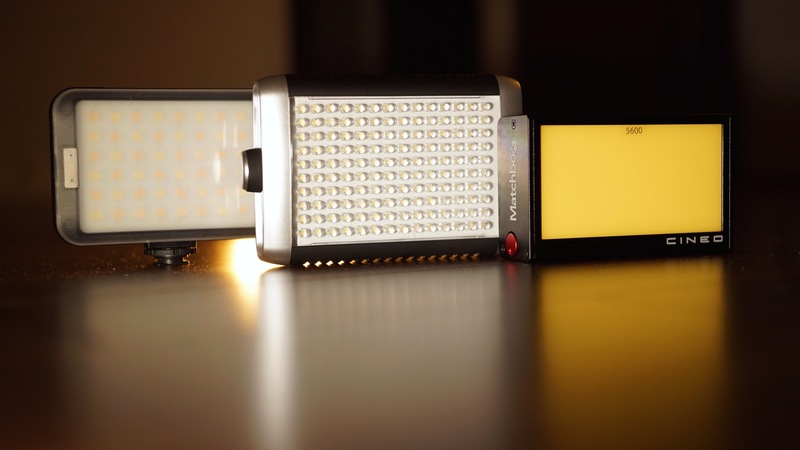 Both the Litepanels Luma and Lumos Trip Pro are built from hard plastic and feel light in the hand. I’ve dropped both of them onto hard surfaces from above 1 meter (not entirely deliberately) and they both continued to work without any problems. The switches and protective panel on the Litepanels Luma feel slightly better made than those on the Lumos. I have had problems trying to power the Luma off rechargeable AA batteries as sometimes it decides to work and sometimes it doesn’t. The Cineo Matchbox build quality far exceeds that of both the Lumos and Litepanels. It’s made out of anodized aluminum and the recessed power and dimmer switch is a nice touch. The Matchbox is a lot heavier than the other two so that also needs to be taken into consideration. The above test was shot on the Sony F35 in 12bit 444 in S-Log S-Gammut and recorded as uncompressed 444 DPX files on the Odyssey 7Q+. 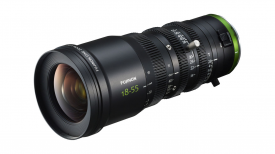 The lens used was a Zeiss CP2 35mm T1.5. The camera white balance was pre set to 5600K and 3200K depending on what I had each of the 3 lights set at. The aperture on the camera was set at a constant T4 so that white was between 60-70% for all three lights. The output of the light was adjusted so that all three provided the same illumination on the test scene. Both the Cineo Matchbox and Lumos Trip Pro provided very accurate colour rendition and were able to keep white looking white at 5600k. The Litepanels Luma did a fairly good job at 5600k but has slightly more in the red and green channels than the blue. 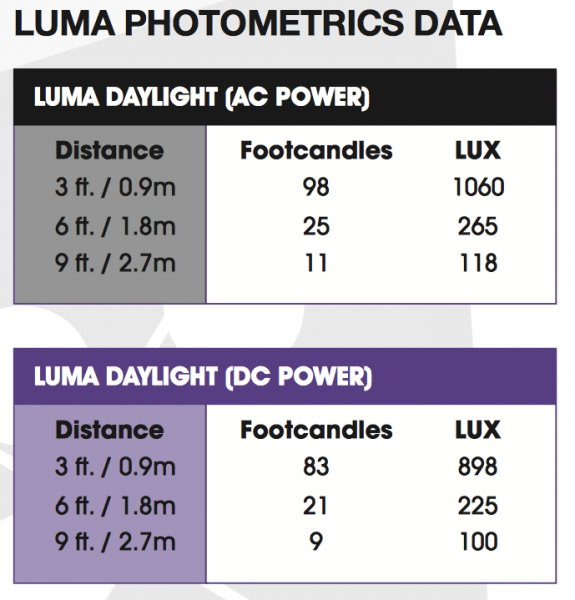 It should be noted though that the Luma is the only light out of the three that is 5600k only. Litepanels supplies a 1/4 and a full CTO in the kit and I used the full CTO for my tests. At 3200K, achieved by use of the filter, the Luma struggled to reproduce colours accurately. There was a big shift in the red channel and in the image you could definitely see it. The Lumos being a bi-colour LED light performed pretty well at 3200k, with a very marginal shift in the blue channel. The Cineo Matchbox comes with a 3200k panel and provided a very nice result when using the 3200k preset in the camera. Again it produced a very small increase in the blue channel but to my eye just edged out the Lumos. All three lights provide a decent output considering their size. The Cineo has a 160 degree beam angle and a claimed output of 1000 lumens. The Lumos has a 85 degree spread and a claimed output of a 100W tungsten equivalent. 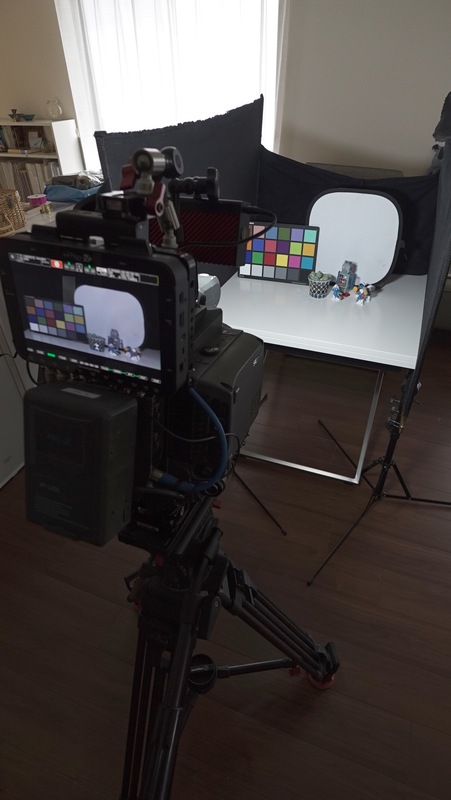 The Litepanels delivers a very wide 50 degree beam angle and is comparable to a 50W-HMI. In my tests I found the Cineo to have the least amount of output of the three, while the Lumos and Litepanels were very close. 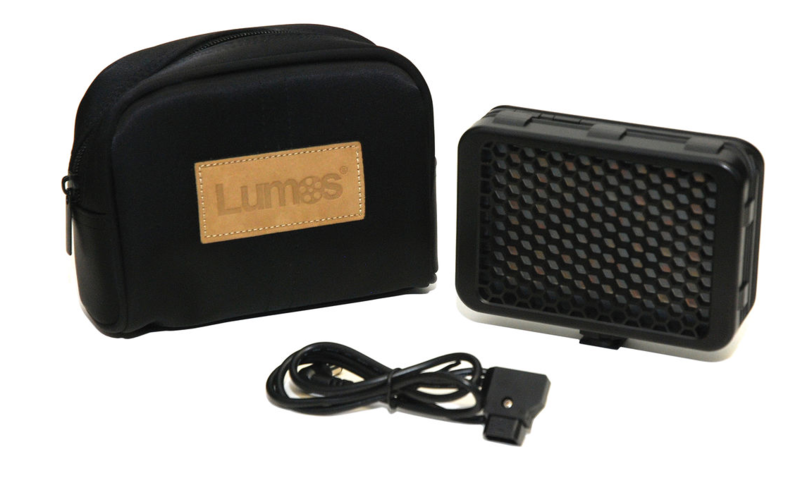 The Lumos comes with a diffusion filter and a honeycomb filter which gives you a lot of extra control when using the light. The Cineo Matchbox comes with an AC Adapter, 6′ Feeder Cable and a power cord, but unfortunately no battery option. The optional Cineo Matchbox Power Kit is available for an extra $154.28 US and includes a Sony NPF-Series or Canon LP-E6 Battery Adapter and D-Tap to barrel connector power cord. So if you do want to run the Matchbox off a battery you’re then going to have to spend even more to buy a battery. It really puzzles me how manufacturers can sell a light that is primarily going to be used as an on-camera or field light and not include a battery option as standard. 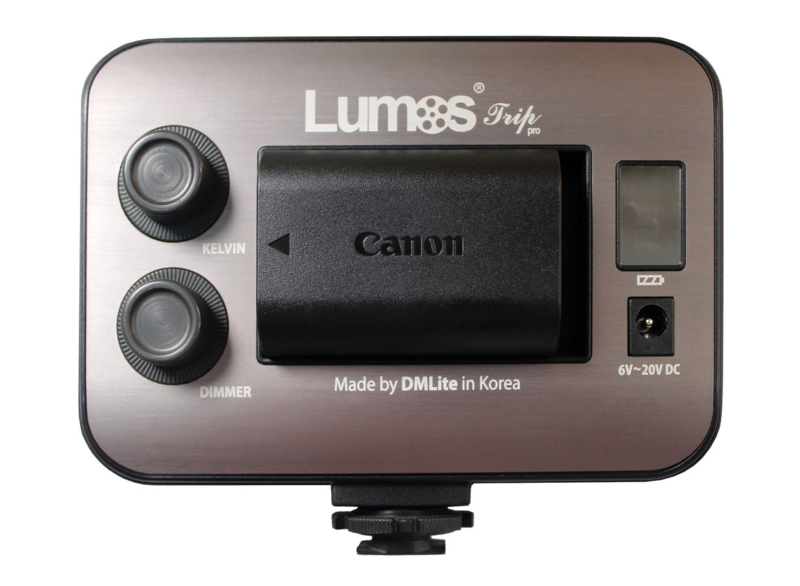 The Lumos Trip Pro consumes 12W and is powered using optional Canon LP-E6 type batteries, or brick-style batteries using an included P-Tap power cable. The Litepanels Luma is powered by default with six AA batteries. It can also run from an AC power supply or by DC power from a camera via a D-tap cable, but these methods are again optional extras. The Litepanels Luma comes with a ball head shoe mount, full CTO gel, 1/4 CTO gel, 1/2 white diffusion gel, custom carrying bag and a one-year limited warranty in the U.S. / two-year warranty in EMEA Countries. The Lumos Trip Pro comes with a honeycomb grid filter, shoe mount adapter, P-Tap power cable, carrying pouch and a limited two-year warranty. 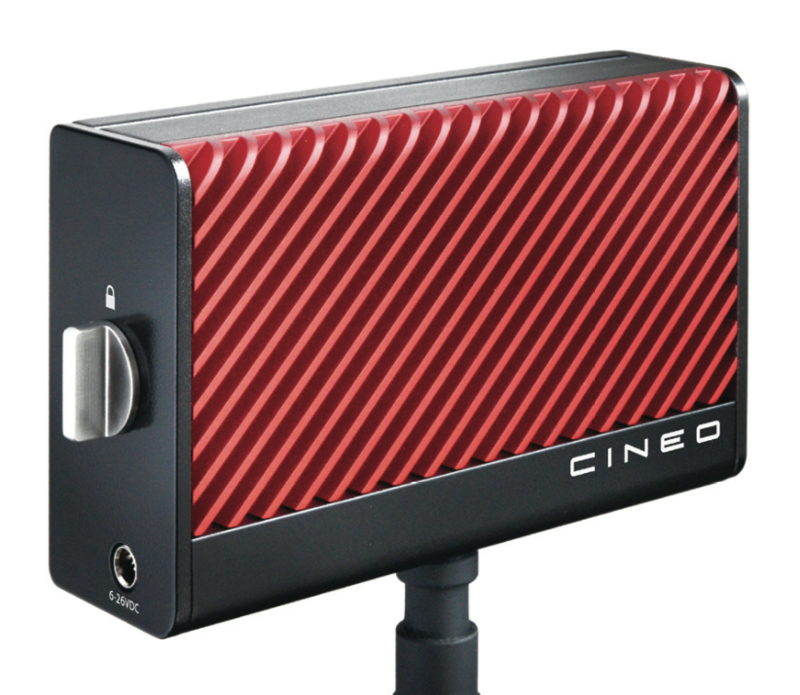 The Cineo Matchbox comes with 3200 and 5600K panels, AC adapter, 6′ feeder cable and a power cord. All three offer a good degree of versatility and can be used as much more than just an on-camera light. 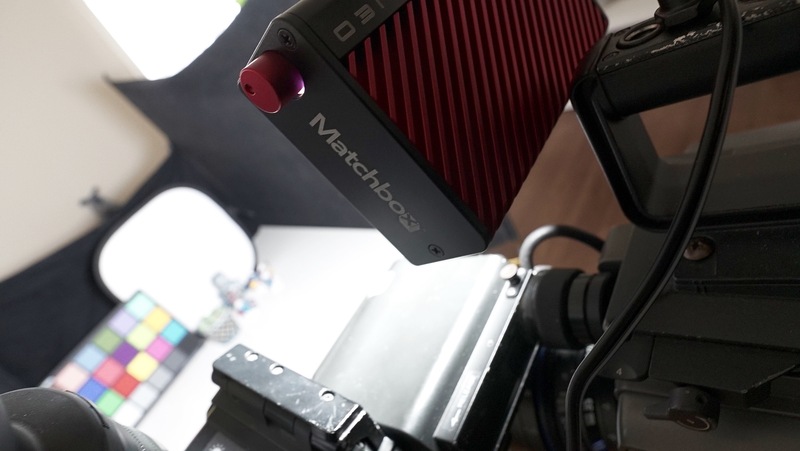 The Cineo Matchbox provides a really soft lighting source thanks to its remote phosphor technology and is probably the only one out of the three I would feel comfortable using as a key light for an interview. In my opinion it’s also the best out of the three at replicating colours: the white is white. The fact that out of the box it doesn’t come with a battery solution marks it down in this category though. The Lumos and Litepanels can be used as small light sources for helping to light backgrounds and with its added punch the Litepanels Luma could be used to bounce into a wall to provide some indirect illumination. Both the Lumos and Matchbox are very accurate at 5600K and 3200k. The Lumos has the added advantage of just twisting a dial to dial in the colour temperature, while the Cineo requires you to swap out the front panel. The CTO filters that you can put in front of the Litepanels Luma really don’t do a good job in my honest opinion. This is probably one of the most important categories – how does the light actually look under real world use? You can do all the tests in the world and even re-white balance your camera to compensate for a light’s colour shift, but you can’t drastically alter the way a small light source performs. It either looks nice or it doesn’t. All three of the lights can be made to look nice and the current crop of small LED/Remote Phosphor lights are head and shoulders above the old bulb solutions I used on ENG cameras in the 90’s. For me though the visual aesthetic from the Remote Phosphor Cineo Matchbox just provides a far softer and more even lighting source. As an on board camera light this is exactly what you are looking for as it won’t give you that ‘Deer in the headlights’ look that a lot of on-camera lights will. All three lights have their positives and negatives, so picking a clear winner was not that easy. For me the Cineo Matchbox came out on top despite only winning three out of the seven categories. It’s the most expensive out of the three and it doesn’t come with a battery solution as standard. It does however provide the best looking lighting source and to my eye produces the most accurate colours. The build quality is also excellent and it feels like a product that will stand the test of time. There is also a vast array of optional accessories available, including a soft box, barn doors and louvre. While these will cost you a lot more to add to the Matchbox it’s good to know you have the flexibility to be able to do it. If the Matchbox came with an included battery solution as standard, it would make the light an even more appealing option. The Lumos Trip Pro was a very close second. I have been very impressed by this Korean-made light and it comes with a good set of accessories. The fact that you can dial in any colour temperature between 3200k to 5600k is something neither of the other two lights tested can do. This may well be the best option for users of small mirorless or DSLR cameras who want a versatile light weight option. The Litepanels Luma has the brightest output and is the only light that can be run off easily available rechargeable AA batteries. It also comes with a nice set of accessories for the price. This combination of features may be enough to tempt some users, but overall the light is let down by colour accuracy and its performance in a tungsten environment when using the CTO filters. 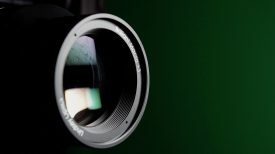 Its physical size makes it more suitable for use on larger cameras and some users may find it too large to be used on a smaller mirrorless or DSLR cameras. There are a lot of other on-camera lighting solutions that have come onto the market recently, including the Zylight Newz and the Rotolight Neo , that I was not able to test at this stage. It will be interesting to do another test in the future to see how they stack up against the Cineo Matchbox.